Wengen is an attractive, traditional, traffic-free village perched in a sunny position above the Lauterbrunnen valley at an altitude of 1275m set in stunning scenery. Arguably the quintessential traditional Swiss resort, Wengen is a charming traffic free mountain village reached only by a cog railway built in 1892. With many of the hotels dating back to that period, the resort has a unique calm, unhurried atmosphere. Sitting on a sunny plateau, it has some of the most dramatic views you will find in the Alps. No matter how many times you visit, every time you arrive the view up the Lauterbrunnen valley with its huge waterfalls and hanging valleys will take your breath away. Restaurants and shops offer classic Swiss fare with excellent mountain huts across the ski area. There is plenty to do for non-skiers with walking, ice skating and 95km of toboggan runs or they can take the train up the mountain to meet the skiers for a long lunch on a sunny terrace. Wengen can be a lot of fun for a small resort with a sleepy image. The Tanne bar is always busy (owner Ronald has a fine collection of premium gins and whiskys) and is a good starting point for an evening, while most of the hotel bars stay open late and some have live music. This is a very friendly resort and, with many guests and owners returning year after year, it is easy to make friends if you wish. It is good choice for a second home as it is a pleasure to visit in both winter and summer. 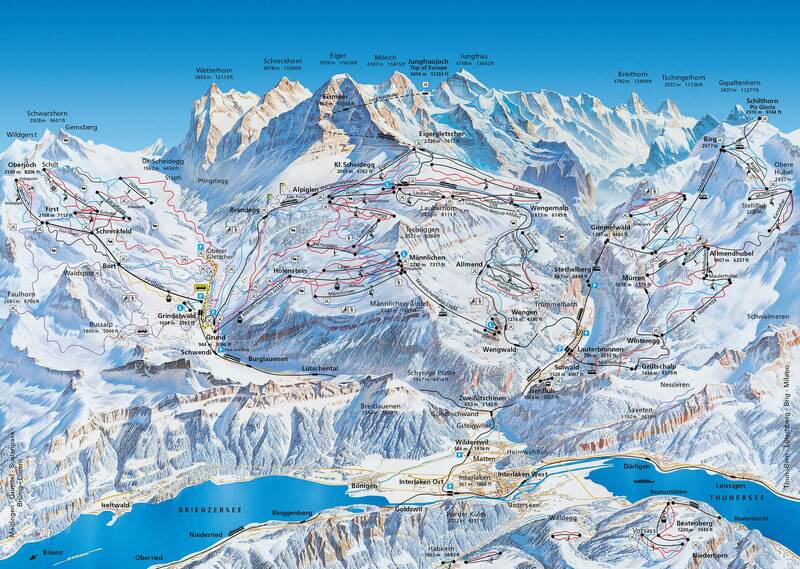 The Jungfrau lift pass covers Wengen, Grindelwald and Murren with a total of 213 km of pistes up to 2970m. The reconstruction of the Mannlichen cable car also now makes a convenient and speedy alternative to the train. The region caters mostly for intermediate skiers, who will have plenty of long rolling slopes to choose from. 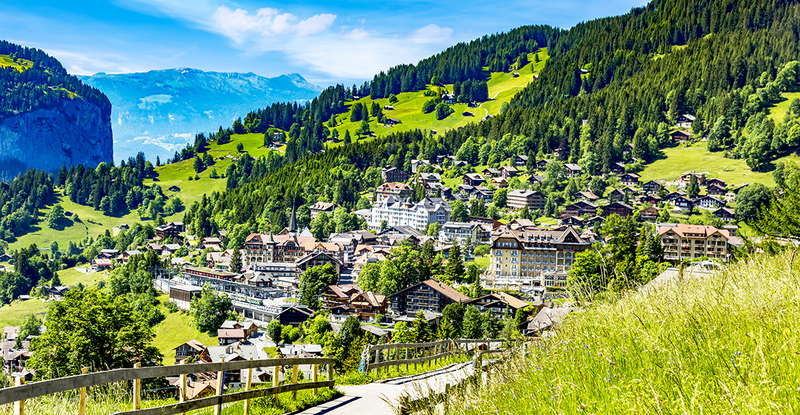 Eat up the miles and enjoy the scenery as you spend a day travelling right across to Grindelwald. Beginners can take advantage of the fantastic teaching in the resort, while experts have a number of excellent black runs and some great challenges such as the Inferno in Mürren, the world’s longest downhill race. The spectacular Lauberhorn international ski race takes place every January and the resort is buzzing, with over 30,000 visitors attracted to one of the highest-attended winter sports events in the world. The course remains open during the rest of the season and has a speed gun if you want to check out how you compare to the professionals. Wengen is a perfect dual season destination with the Lauterbrunnen valley just below and Interlaken and Lake Brienz nearby. This gives you access to a multitude of lake activities as well as Interlaken golf course. 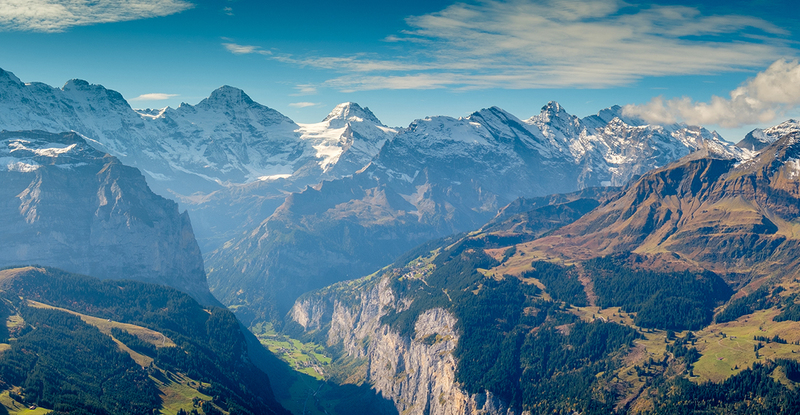 Tours to the Jungfraujoch, the so called "Top of Europe", which provide truly spectacular scenery also go year round. With over 500km of sign-posted hiking trails, plenty of mountain biking and 15 mountain railways and cable cars, the area is easy to explore. The Eiger, Mönch and Jungfrau are all famous peaks, with serious mountaineers making the journey to the area yearly to climb them. For those less interested in feats of endurance, there are many less strenuous activities available. Wengen has an outdoor pool, tennis courts and mini golf on offer. Or, just relax in this most relaxing of resorts. 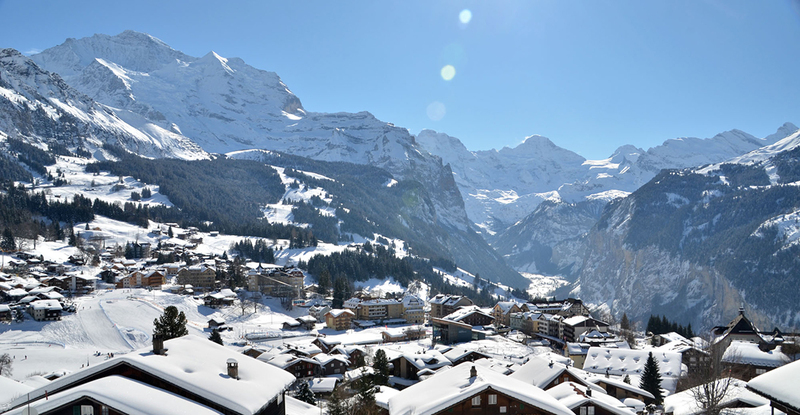 We always have a good range of resale apartments in Wengen from studios to ski in, ski out penthouses. Excuse the cliché, but we really do have something for everyone, whether you want to be on the main street, or you prefer privacy and scenery away from it all. 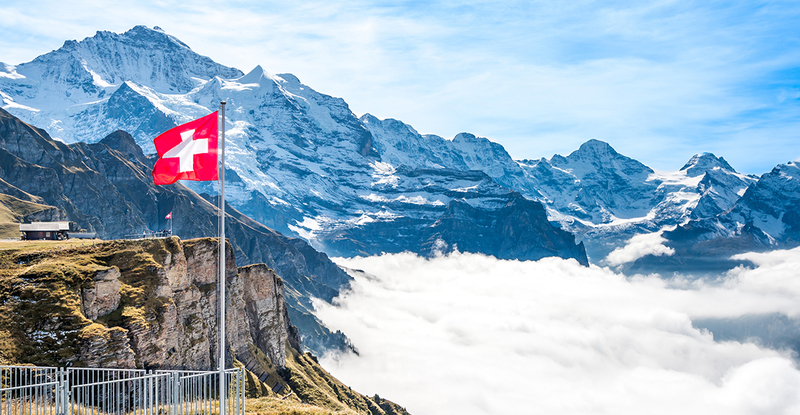 We have many clients who, having been visiting Wengen for years and years (and perhaps even learned to ski there as a child) would never even think of buying in any other resort. 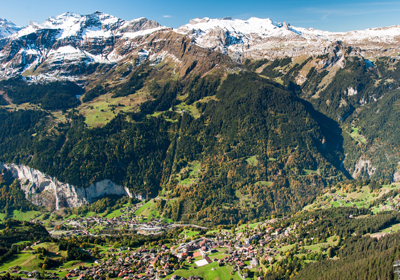 As Wengen has such a loyal following the property market is quite dynamic, and the turnover of properties can be quite fast. Whilst foreigners are permitted to buy most apartments, a local rule restricts the sale of detached chalets only to Swiss residents. It is very rare for a chalet to come on the market, and when they do they tend to be snapped up very quickly. 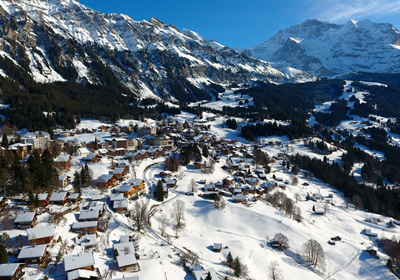 Some foreigners have chosen to apply for a residence permit in Wengen so they may buy such a property and use it for several months of the year. Now with the new Weber laws there will be no more new-builds but we do occasionally have older buildings which have been refurbished. We also have hotels for sale in this resort which are available for foreigners. Set in a spectacular position of Wengen with breathtaking views of the village, Jungfrau Mountain and Lauterbrunnen Valley is the Alpenrebe apartment. An extremely impressive top floor apartment in the charming resort of Wengen, Primula is located just two minutes from the station in a sunny position with stunning views. Chalet Mutzli is a small, traditional chalet with stunning mountain and valley views that has just become available in the charming resort of Wengen. Chalet Alpha is a charming chalet-style apartment building sitauted in a picturesque position, recieving the first sun of the day and providing fantastic views down the valley. 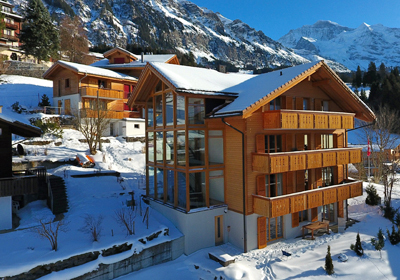 A unique opportunity has just come on the market in Wengen, consisting of an entire chalet composed of four separate apartments over four floors. Waldgarten is a traditional apartment building located near the centre of Wengen in which two ground floor residences have just become available. The Alpenheim is an historic chalet and barn situated just below the station in the beautiful, dual season resort of Wengen. A two bedroom penthouse apartment with superb Jungfrau views and an established rental income. A traditional Swiss chalet set across three floors and located right in the centre of Wengen, just a three minute walk from the station. Located in a highly sought after ski in, ski out position right on the slopes of Wengen and just a short walk to the station is the Luise Apt. Primera is a spacious two bedroom, two bathroom apartment in a quiet location just a short walk from Wengen's traditional village centre. Situated in a peaceful location down from the centre of Wengen, a cosy two bedroom apartment has just come on the market in a traditional residence. Chalet Sulegg is located in a peaceful and picturesque position with stunning views down the Lauterbrunnen Valley of the Jungfrau and Breithorn. Chalet Anita is a unique opportunity to own an historic chalet right in the centre of Wengen and surrounded by picturesque south facing views. The Eden apartment is a high quality, ground floor residence which has just become available in a prestigious development located in a convenient and central location of Wengen. The Panarama Park is a recently constructed, peacefully positioned development within which a one bedroom resale apartment has just become available. Eagle's Nest is a new development of just four prestigious apartments situated in a convenient position within the charming resort of Wengen. The Bijouli residence is situated in a secluded and private position below the resort of Wengen and surrounded by breathtaking scenery. A stylishly furnished 4 bedroom duplex in a picturesque location with incredible views in the direction of the Jungfrau. The Schweizerheim Apartment is a modern duplex residence located close to the centre of Wengen and less than a ten minute walk from the station. Brunner 2 is a high quality three bedroom apartment, located in one of the best positions above the traditional Jungfrau resort of Wengen. 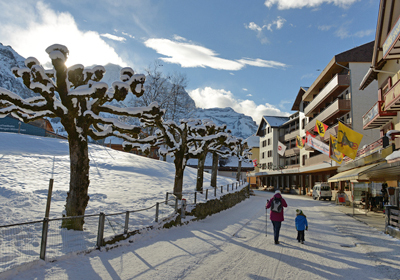 Racers Retreat is a development of semi-detatched chalets located outside the centre of Wengen. The Margaux apartment is an attractive studio residence that has just come on the market in a quiet area of Wengen. This duplex apartment is arranged over the first and second floors of a beautiful historic building, located just below the scenic traditional village of Wengen. Positioned close to the centre of Wengen, Barg und Tal is an attractive residence offering fantastic mountain views from both it’s balconies. A spacious 4 bedroom penthouse apartment in a convenient central location with ski-in access. 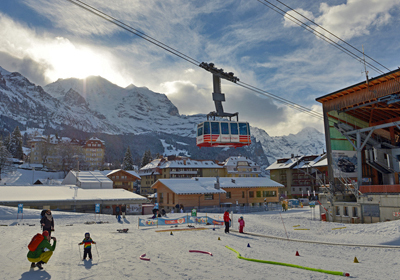 The hotel is located near the centre of Wengen, a few minutes’ walk from sports facilities, the ski slopes and the hiking trails. 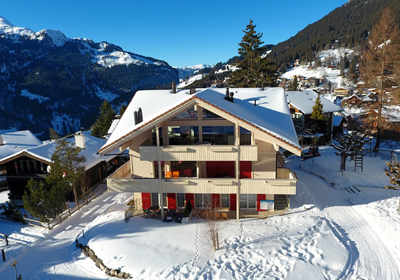 Chalet Central is an ideally located top floor apartment, situated in the heart of Wengen, available for purchase by foreigners and in a good condition. The Hotel Alpenruhe is a beautiful and historic hotel built on a picturesque plot in Wengen over 100 years ago. Situated about halfway between Lauterbrunnen and Wengen along the famous Via Alpina trail, this chalet boasts stunning views and a genuine sense of seclusion surrounded by nature.